A storybook ending, to a magical year. The first Venice Invitational 2018 did not disappoint. US Women’s National Team player Allie Long decided the all star game wasn’t enough, and she needed to play in the tournament with her husband and friends. Turned out to be a smart move, as Allie definitely got her off season touches in on the day and won the whole thing in the process. NBA MVP Steve Nash showed the people of Dogtown that his talent is universal between sports. Premier League & MLS Legends combined to put on a show during the Legends game for the biggest crowd Venice has ever seen at a soccer event. The Estadio never looked so good. 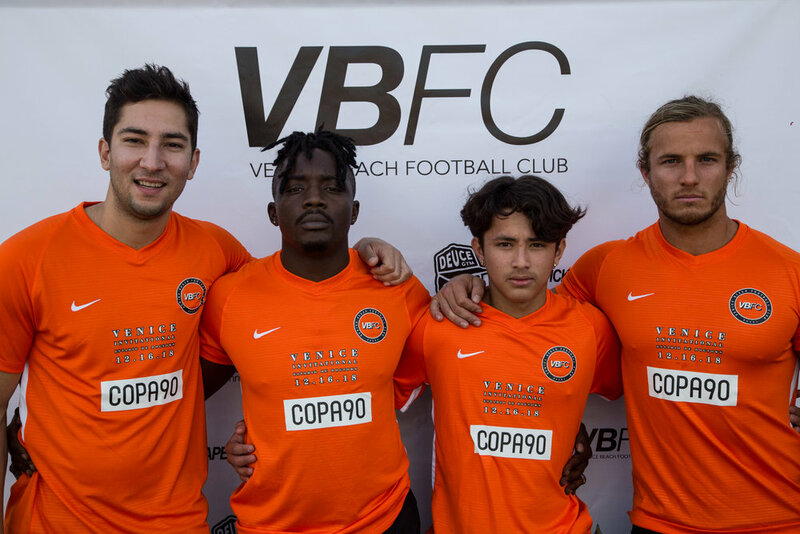 We were blessed to cap off a year that saw Venice host talent from across the globe, including FC Barcelona, Tottenham Hotspur, and numerous others. 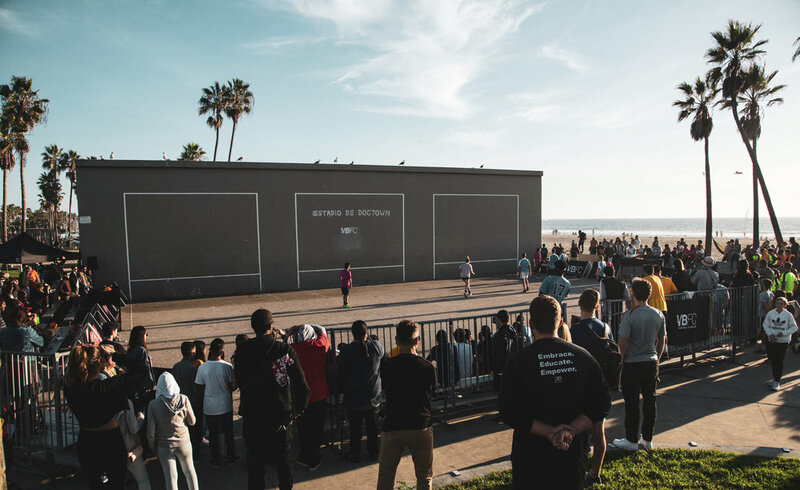 For nearly 2 years now, every Sunday at Estadio de Dogtown, locals play into the moonlight company of professional players, internationally-known musicians, local high school /college players, homeless and everybody in between. The event itself was a celebration of football's presence in Dogtown, as the local community showed up in numbers to support their hometown club. 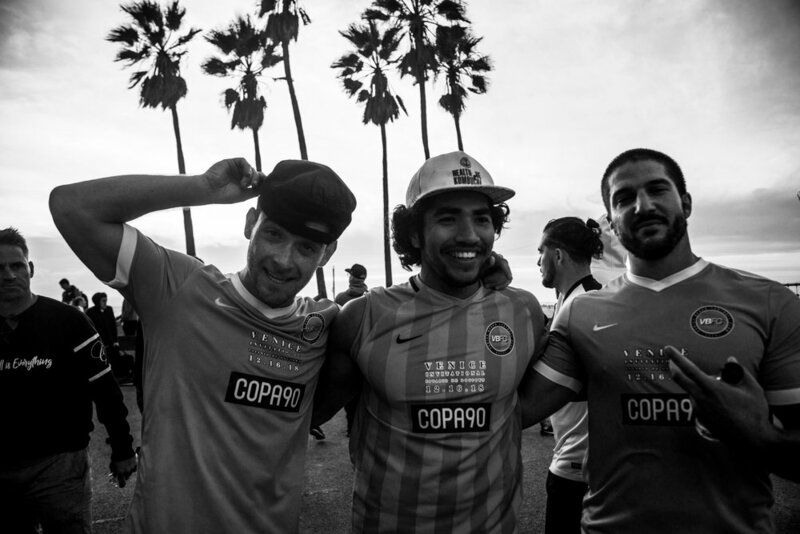 Venice Beach Football Club, in collaboration with COPA90, present to you the first ever Venice Invitational. A tournament that celebrated some of the top talent to grace the Estadio over the last year. The party got started on the sand at Muscle Beach, right around the Estadio wall. There was Samba music being played, bicycle kicks being flung in mid air and good vibes all around in the Venice Invitational Futevolei tournament. Exciting matches, postcard-like weather, the California sun, the beach and of course Roge and company's delicious "mate". It's quickly become tradition to sip on a cup of "mate" between games. There's no better way to enjoy futevolei in the California sun. Roge and company eventually presented __________ (insert names of winners) with the first Futevolei championship trophy, thus forever engraving their names in the sand of Muscle Beach forever on. Estadio's finest footballers, almost completely comprised of participants of our Sunday pick up games throughout the year, were called upon once more in 2018 to showcase their talents on the court. This time, the audience was larger than ever. Fans, players, tourists, locals, neighbors, family and friends were all part of a diverse rowdy crowd. Local talent was abundant on the day, featuring the likes of Nick Santhiago (VBFC, UC Berkeley, Golden State Force) and Alessandro Canale (US Beach National Team, UC San Diego, Orange County FC). Sunday regulars Michael Rosario, Karim Barcelo, Igor Lants, Ashley Oswald and many others. Special guest, Allie Long (US Women's National Team, Seattle Reign), brought her crew of New Yorkers to rep the east coast in America's most sought after pick up game; only now trading the Atlantic breakwater for the cool, Pacific breeze. All eyes were on the court, no one wanted to miss a second of 5 straight hours of high-stakes concrete futbol. The Finals Included The blue team captained by Igor Lantsburg and the red team captained by Allie Long. Both teams went on lengthy runs and had the most wins, which also means they played the most games. No one said it would be easy, and each team played immensely over the two 10 minute halves. Blue team jumped out to an early lead with goals from Drew Degurian and Igor Lantsburg. Red responded though, getting 3 in a row the last being Allie Long stripping the defender to slot it in on an open net.